Through out the mango season I kept thinking of making some dessert or sweet out of this king of fruits. However, for some reason it never happened and now the season is almost over. A few weeks ago I came across this recipe for mango cake that sounded really new to me. I had heard of only Mango cheese cake not a baked mango cake. I got really interested and started going over the procedure. To my delight I had all the ingredients and the procedure seemed really simple. I got my baby to sit in front of her favorite cartoon show and whisked this cake up in 20 mins. I put it in to bake and joined my baby who had barely noticed that I wasnt around. 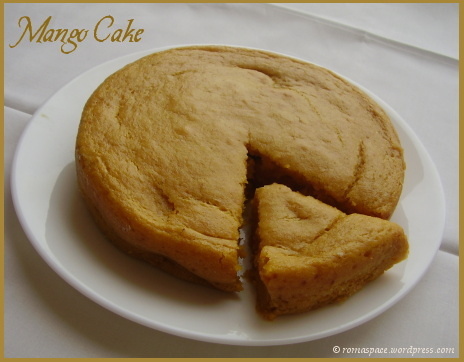 This is another recipe to bake a healthy cake as it has the goodness of wheat flour, curds and mango in it. You can find this recipe at La Gourmet Chef. I made about 1/2 the quantity and did not add pistas to the cake. Thanks for sharing this interesting recipe with us. Nice cake! I would’nt blame your daughter for wanting to dig in! I would have done that myself. It looks very clean and simple. Lucky you, have managed to get mangoes at this time of the season. I have already bookmarked it to try in the next season. Cake has come out well. looks delicious…can imagine the taste..yummy!! Wow! really a very nice roundup! first time to ur blog and it is tooo good! i missed ur event yar! will surely join in the next! Welcome to my blog Srilekha! Sorry you missed this event. Anyway, I’ll keep you posted on the next event whenever its on.